Isn't that photo wonderfully toady? I do think that gherkins are a fairly unattractive food, but a good gherkin is not to be sniffed at. They complete the store of pickles that you might have in the fridge, sitting alongside the pickled onions, gleaming through the glass. Lovely! Maybe one day I will make pickled eggs. But the problem is will I want to eat them? But they must be crunchy, and tart, but not too much so. Gherkins form part of a perfect burger, perfect with a ploughman's lunch and an essential accompaniment to rillettes. I love it when, in autumn, you find a box of little gherkins in the shop just waiting to be pickled. I have not yet been lucky enough to find a plentiful supply of the tiny cornichons, but maybe next year. 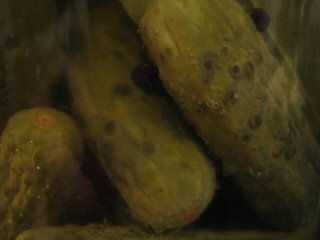 As with the kimchi and pickled onions, you need to have a large preserving jar in which to pickle the gherkins, which needs to be sterilized and then sealed according to your chosen method. Here is an example. gherkins, enough to fill the jar you are intending to use, I used a 1.5L preserving jar..
Salt, enough to generously toss through the gherkins. Wash and dry the gherkins ,then toss with the salt and leave for 6 to 8 hours. I have found that over night is too long and results in a gherkin that is too soft, salt and acidic, but that is probably because I do not salt them just before I go to bed and proceed with t he next step as soon as I get up. Mix half the vinegar and the water and use to rinse the salt from the gherkins in a large bowl. Drain and put in a sterilized jar with the bay leaves and some allspice and peppercorns. Cover with the remaining vinegar and seal the jar according to your preferred method. Leave for at least a month before trying the gherkins. Refrigerate after opening. toady... such an apt desciption of gherkins. NIce post. Emma, your recipes descriptions are excellent. I didn't know you were such a food enthusiast. Thanks Jenjen - good to hear! Tanya - great to hear from you! I am heading over to your blog now . . . how funny, the places we end up.